The prestigious technology and innovation magazine Fast Company announced the 50 most innovative companies in the world this 2019. The ranking shows companies that offer greater impact on industry and that are, in some way, changing the future of the market worldwide. It features consolidated and traditional companies that are in a process of modernization, as well as new startups that bring innovative solutions to easily solve everyday problems. A common item among these companies is the possibility of expansion! When it comes to investment in expansion, Latin America has attracted major brands from all over the world, thanks to some factors that are crucial for the region to stand out – like size of the territory, growth of the economy, and development of the population. According to the study on the New Latin American Consumer, by 2030 85% of the Latin American population will be urban, increasing the demand for infrastructure and services. Additionally, in 2018 the region exceeded the mark of 61% of the population with access and connected to the internet. This fact results in greater consumer empowerment and positive expectation for those who want to invest. 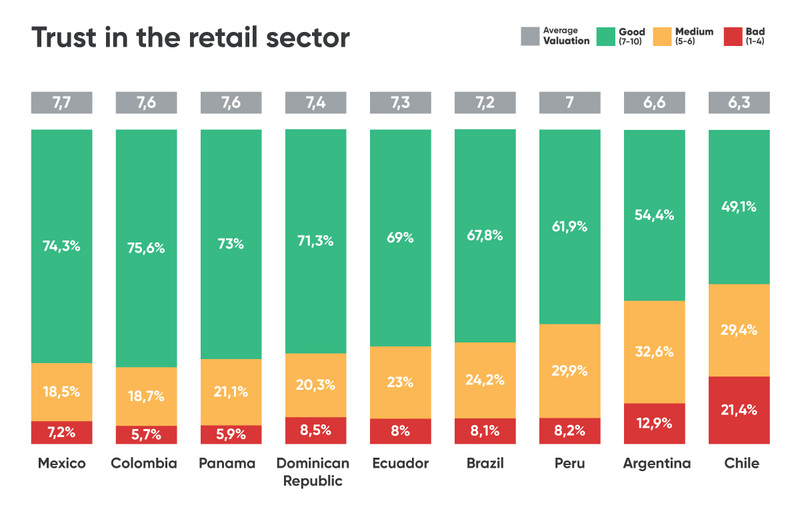 Companies that are at the top of the Fast Company list in retail are already investing in Latin American countries. They do not stand out for offering distinctive products, but for reducing the bureaucracy and innovating when offering access to its services. AliExpress, for example, has become the international e-commerce where Brazilians buy the most. The brand is part of the Alibaba group, an Asian giant in online sales, also responsible for the creation of the Single’s Day (November 11), which has become the biggest online sales event in the world, beating Black Friday and Cyber Monday combined. In 2018, the event had record sales, reaching BRL 115.125 billion globally. The market is developing at a fast pace and whoever comes first can thrive. Retail businesses wishing to invest in Latin America must think of simple and efficient solutions to win over the Latin American audience. In addition to quality and variety of products, they must overcome the challenge of delivery logistics, offer different methods of payment, attractive promotions, and facilitate the purchase with a good website structure. This is already a step towards success here. In an interview with Vinicius Donin, founding partner of RD2 Ventures, a venture builder focused on creating new startups, such aspects get even more evident. Do you consider Latin America a promising market for foreign companies? Why? Very much. First for the market size, which is relevant both for new investments and for expansion. Additionally, there are many opportunities due to the maturity phase regarding the dissemination and adoption of new technologies, since we still have a developing market. Do you believe that the Latin American audience wants straightforward solutions when buying online, especially in retail? This is a global trend. The mass adoption of new technologies does not necessarily go through understanding how the technology works, but through the ease and benefit it brings to everyday life. The major challenge in retail is the integration of channels and how to transform the entire purchase process (from decision to payment) in the most smooth (and simple) way possible. What differentials must a company have to join the Latin American e-commerce market? It is important to understand the local dynamics and behavior – from preferences and profiles related to the products to how the market usually buys, such as different methods of payment and installments, for example. Another focus point refers to the local logistics and its primary means, which directly affect the operation in the country. How do you believe companies can differ from others to satisfy this audience? More than ever, it is imperative to have in-depth knowledge regarding existing (and potential) customers, as well as their consumption profiles. We live in the age of experience, and experience is directly connected to how much is understood about your client. The goal: to offer the right product, at the right time and in the right condition. Is Brazil the main country to invest when thinking about expanding to Latin America? Brazil alone represents almost 40% of Latin America’s GDP. It is an important number in terms of market, and the country also has important (and successful) cases of foreign investments. It is a fact that foreign companies interested in Latin America at some point should look at Brazil, precisely because of the relevance and opportunities in the creation of new business, expansion and consolidation. What makes a business “innovative” in the market in which it operates? At RD2, we aim, through technology, at creating new services/products in different markets. Over time, we noticed that innovations are new ways (solutions) to face problems that are not necessarily new. For example, for the mobility issue, the focus has gone from taxi to transportation apps (cars), and is currently on bikes and electric scooters. Therefore, in practice, innovation has a lot to do with getting closer to the target market, seeking to understand and monitor the evolution of expectations. There is, indeed, a lot of room to be explored for companies wishing to invest in Latin America, since the market is developing and has an optimistic forecast in the coming years. For retail entrepreneurs, it is important to stay aware of straightforward solutions for selling to the end user. Channel integration, efficient logistics, and local payment methods are points of attention for those who want to invest. Additionally, aligning internal processes and finding strategic partners are crucial for a business seeking to explore the “blue ocean” which is the Latin American market and all its opportunities.